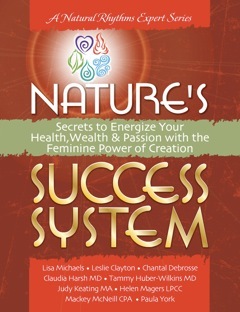 Paula York is a featured contributor to “Nature’s Success System” a recently launched book. Every story in “Nature’s Success System” invites you deeper into the wisdom of nature. Use the secrets in this new book to energize your health, wealth, & passion with the feminine power of creation. Would you like to begin to prosper and thrive financially in more soul-filled ways, strengthen your authentic leadership abilities as you nourish your inner femininity, or experience a deeper sense of your purpose and passion as you fully express your essence? The rich content of this book will help you gain some vital support from Nature for the organic growth of your creations and strengthen your inner abilities to powerfully expand your business and life success. Each chapter focuses on a specific way of utilizing the elemental forces or nature’s rhythms to enhance your ability to thrive. Introducing eight extraordinary women from all walks of life who have mastered Nature’s success system to energize and enhance health, wealth, and passion in their personal and professional lives. Along with Natural Rhythms author and president Lisa Michaels, their stories and insightful strategies will inspire and empower you. Discover tools to live your life richly and fully by engaging the elemental forces of Nature and embracing the Feminine power of creation now.